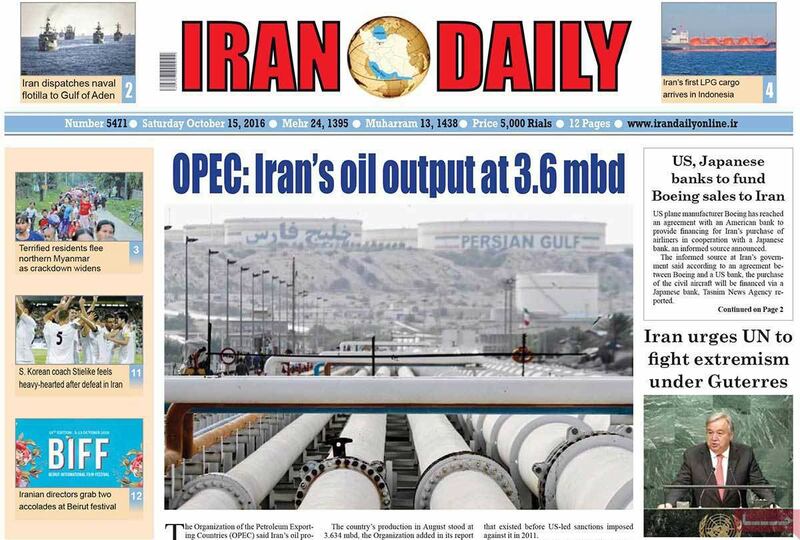 The Organization of the Petroleum Exporting Countries (OPEC) says Iran's oil production has reached a new record high of 3.665 million barrels per day (mb/d). OPEC in a monthly report said it had recorded Iran's new oil production capacity for September. The country's production in August stood at 3.634 mb/d, the Organization added in its report as reported by Azernews.az. Iran is presently OPEC's third largest producer after Saudi Arabia and Iraq. It has repeatedly announced that it plans to increase its oil production to as high as 4 mb/d that existed before US-led sanctions imposed against it in 2011. The sanctions mainly prevented foreign investments in Iran's oil industry that it needed for its oil production. They also restricted the country's oil exports to around 1 mb/d. Before the sanctions were lifted, Iran said it had made the necessary preparations to boost its oil production capacity to pre-sanctions levels. Iran's Petroleum Minister Bijan Zangeneh had repeatedly emphasized that the Islamic Republic was determined to regain its share of the oil market that it had lost as a result of the sanctions within a short period of time. Iranian oil sales have nearly doubled since sanctions were lifted on its oil exports in January 2016. In fact, Iran is recovering market share faster than many experts had expected, Azernews.az added in its report. In early June, Reuters reported a rapid surge in Iran's oil exports which in itself indicated a rise in the country's oil production. Reuters said shipping data showed the country's oil exports were close to pre-sanctions level of 2.5 million barrels per day, stressing that it had been able to improve its exports capabilities at a much faster pace than anticipated.